Wednesday afternoon, Ketchum’s Mike Sinnott put his car in gear and drove from San Francisco to Los Angeles. Think California—he wasn’t exactly driving in a convertible, carefree with the wind in his hair, but he felt relaxed and ready to rest. After all, Sinnott was the newly crowned king of the U.S. Ski and Snowboard Association (USSA) SuperTour, having earned the season championship April 11 during the final race of the 2012-13 season at Royal Gorge, Ca. He’ll be training to compete on the International Ski Federation (FIS) World Cup, having earned FIS-funded start rights by winning the SuperTour season title in his sixth season on a tour that is just below the World Cup on the competition scale. 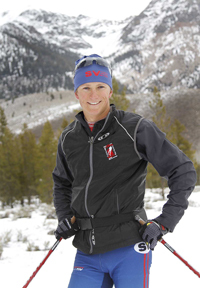 Rick Kapala, head coach and program director of the Sun Valley Ski Education Foundation’s Nordic ski team, said, “Mike is now in a good position to spend four weeks in Europe at the start of next season, in that ‘get your feet wet’ period. “He has competed on the World Cup in Europe before, but now he has earned funded start rights through the FIS in the first period of about seven races next season. That means room and board and transport is all paid. “I’m very excited,” said Sinnott. “I hadn’t really put together a full season like this one, but I’ve been building and progressing. It was a solid season. I was skiing quite well. It wasn’t easy winning the SuperTour yellow jersey emblematic of the top season points, and its $1,200 top prize. But Sinnott certainly put in the time and effort. No other male racer competed in 22 SuperTour events like Sinnott did. Entering the April 4-11 SuperTour Finals near Lake Tahoe (Ca. ), Sinnott led the men’s season standings with 342 points ahead of Bridger Ski Foundation’s Torin Koos (290) and third-place Erik Bjornsen of Alaska Pacific (239). Officially, Sinnott picked up 132 points in the five Finals races counting toward SuperTour season ranks. He ended up with 474 points, just holding off talented 21-year-old Bjornsen, who finished with 445 including 206 by winning the SuperTour Finals mini-tour. Bjornsen, who earned his first U.S. National title in the men’s 15k freestyle sprint Jan. 4 at Soldier Hollow, Utah, captured the 3.3-kilometer freestyle prologue opener by 14.5 seconds at Donner Summit April 4. Sinnott placed third. The next day, Bjornsen from Winthrop, Wash. kept up the pressure with a second-place 15-kilometer classic finish behind U.S. Ski Team racer Kris Freeman, 32. Sinnott was sixth. On April 6, SVSEF Gold Team racer Sinnott placed sixth in the Men’s A Final of the classic sprint. Bjornsen was delighted to finish third in that race, meaning he had sliced 40 points off Sinnott’s lead with two races to go. Then, in brutal windy and driving rain conditions turned into snow, Sinnott battled into seventh place at the merciful end of the 6k freestyle hill climb up Sugar Bowl’s Mount Disney April 8. Bjornsen ended up in fourth place and cut his deficit to just 45 points behind Sinnott, 472-427. “It was beautiful, and miserable—a whirlwind of different things,” said Sinnott about the pivotal hill climb test. One race to go and a tough test at that—the U.S. Long Distance National 50k mass start classic April 11 at Royal Gorge. Because it was a double points race, the finale would award 60 points to the winner instead of the usual 30 first-place points. Sinnott started shakily on a warm day with slow snow. As it turned out, Bjornsen (2.30:41) finished 12th overall six minutes behind winner Kris Freeman (2.24:52) and picked up just 18 SuperTour points, while Sinnott climbed all the way up to 20th place (2.35:48) and earned two points. Notably, Sinnott also won the SuperTour sprint season title 200-167 over Bend Endurance Academy’s Dakota Blackhorse von Jess. And the youngest of three children of Ed Sinnott and Carol Sinnott picked up 102 distance points during the Finals Week to jump from third place to second place in the season distance ranks, 307-274 behind winner Bjornsen. Kapala said, “Mike had a solid day in the 50k to preserve his lead and really finished with a solid week at the Finals. His whole season was a commentary on his consistency. Professional ski racing demonstrates who shows up day-after-day for five-and-a-half months. It’s about sustained performance. Former Dartmouth College ski team captain Sinnott, who captured his third consecutive U.S. National silver medal in the classic sprint Jan. 2 at Soldier Hollow, didn’t spend much time atop the podium this year. He came within a whisker of capturing his second Boulder Mountain Ski Tour crown Feb. 2, finishing fourth. A memorable moment was winning the classic sprint “A Final” during the five-stage Tour de Twin Cities Jan. 25 at Wirth Park in Minneapolis, Minn.
It’s not like Sinnott puts his feet up and relaxes during the breaks from racing. He keeps in close touch with his second-year coach Colin Rodgers, 31, the SVSEF Gold Team director who is close in age and still a competitor himself. Sinnott and Rodgers placed third and fifth in the 21k Owl Creek Chase at Aspen, Colo. Feb. 10. Reminded of the pride the Wood River Valley takes in his accomplishments in Nordic skiing, the co-valedictorian of Wood River High School’s graduating class of 2003 instantly replied how proud he was of where he was from.